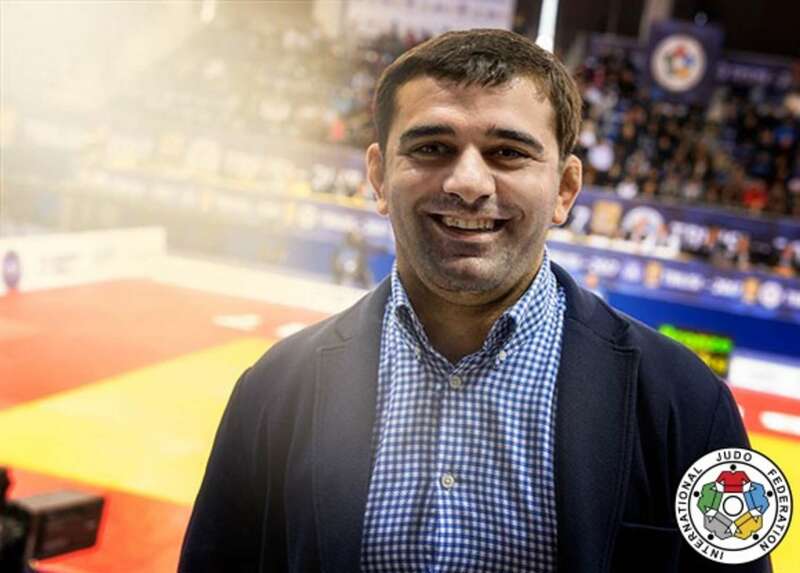 With a stocky silhouette and cauliflower ears, there are no doubts, David KEVKHISHVILI is a judoka of the calibre of those generations of athletes who have been trampling tatami for decades just because of the love for our sport. Several times a European medalist, he is today the happy President of a federation that regularly gets results. As for three days, all the spotlight is focused on Tbilisi where the second Grand Prix of the season takes place. David KEVKHISHVILI explained with passion and emotion the reasons for such a success. 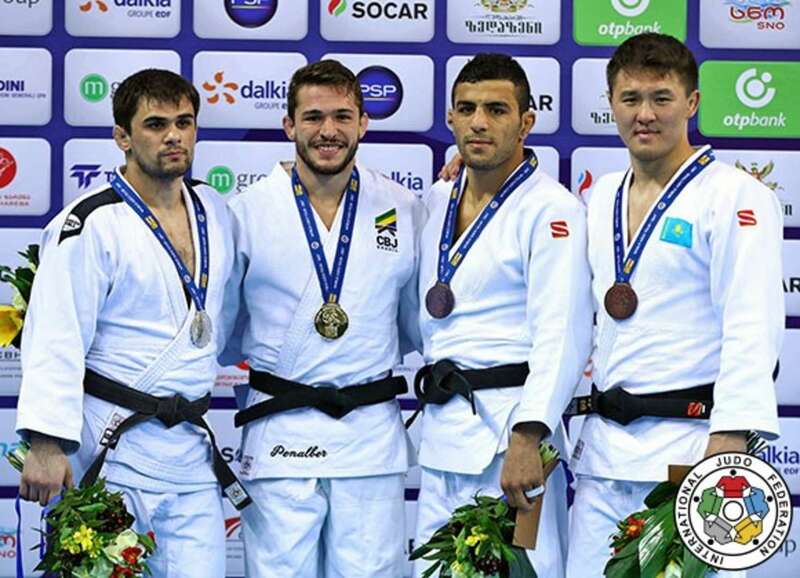 To the question, why Georgian judo has managed to impose its style on the international level, his answer is straight: "We have this in our blood. It's in our character. Georgia has had so many wars in its history, so many people have come here to fight, that this fighting spirit has remained in the genes. Today we are peaceful and militate for peace. Sport allows us to express our character and this is especially true with judo. " President KEVKHISHVILI also explained how technically speaking, judo has established itself as the country's number one sport: "In Georgia, we have a tradition of fighting sports: Chidaoba, but practically exclusively practiced within our borders. When judo began to spread from Japan to the rest of the world, we were already, with a few adaptations, ready to become performers in this new sport. Step by step, we have built a true tradition of judo that still persists today. " To speak of the tradition of judo in this small country of the Caucasus region is not an empty word. To date, Georgia has 5 World Champions, 6 Olympic Champions, but also three World Team Championship title and eight European Team titles: "With a population of less than 4 million inhabitants and around 5,000 judoka, we can be proud of our results and proud of all what our champions have achieved over all these years. "But we have to keep moving forward. We always want to make progress. The work we do with the IJF Academy helps us in this direction. We are working on the tactical aspects of judo as well as on the groundwork, which was one of our weak points" (see below in the technicians' corner). The face of the Georgian team has grown considerably younger on the occasion of this Grand Prix. 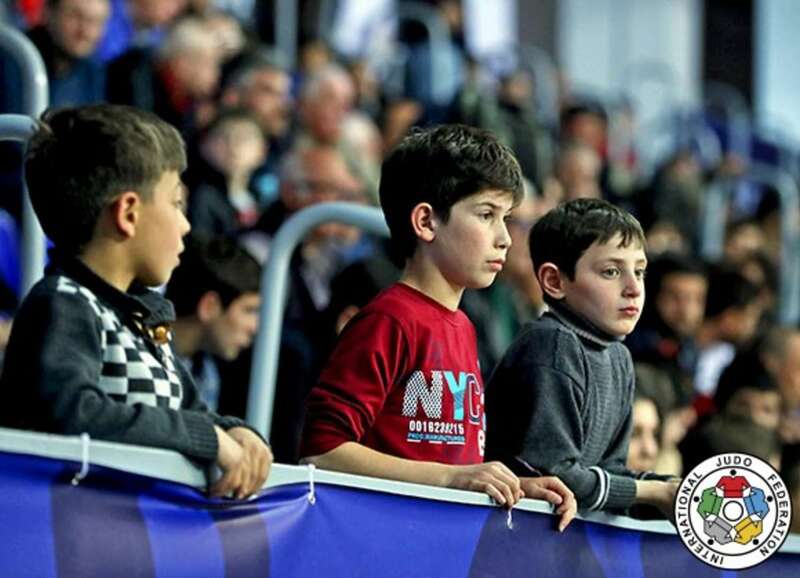 KEVKHISHVILI explained why: "We have had a continuous history of judo development since 1970 when the first edition of the Tbilisi Tournament was held in our city. Now being a Grand Prix of the world circuit, this tournament remains a fantastic playground for our young athletes who need to meet the world's bests. If we have put some of our top judokas to rest, it is because we are already preparing the next generation of champions. It is a risk that we assume and I am sure that this choice will bring even more medals in the years to come." Georgian judo is worldwide known for its male performances, although the development of female practice is relatively recent: "If we have a long tradition with our men's team, we do not have the same story with women. We have to build a tradition, and we have been doing this for several years now. We have already achieved good results with the youngest (cadets and juniors) and I think that very quickly we will see emerging female Georgian athletes at the top of the senior world rankings. This is important for the universality of our sport." In conclusion, President KEVKHISHVILI said: "Judo is a family. This is particularly true in Georgia. But it is not simply about glory and results. We want to attract more and more people to judo and show that this sport has real values ​​that are useful for the whole society. We stand by the IJF and its President, Marius Vizer, to make judo even more popular." In recent years, the IJF Academy has been one of the leading success stories of the International Judo Federation. In connection with the work carried out in Georgia, Envic Galea, its director, looks back on a success that keeps growing. "For the past four years, the IJF Academy has been perfectly working. To date, we have qualified 470 coaches in level 1, and we currently have 380 students from more than 40 countries who take the courses. We have new programs also in Albania and Croatia, while Venezuela should soon join the adventure. More specifically in Georgia, 90 coaches have passed Level 1 and in February we started Level 2. "Georgia joined the Academy programs from the very beginning, as it was the second country to integrate the Academy syllabus into the training of its coaches. To facilitate the transfer of competencies, all programs have been translated into the national language because our objective is to guarantee a universal level of knowledge while adapting to each country. "We place particular emphasis on technical judo, of course, but also on the scientific dimension of training. Training athletes has become an exact science and we all need to adapt to that. Coaches, as well as the athletes, must have goals if they want to achieve results. "As I explained, it is also crucial that we go back to the fundamentals of our sport. All students must know all the techniques of the Kodokan. If you want to train good competitors, you need to know the vocabulary. But if this is obviously true for competitors, it is equally so, or even more, to teach judo to the younger ones. It is interesting, for example, to see what the knowledge of the katas, which it must be said tended to diminish, brings to the coaches and their pupils. They can learn the basic principles of our sport, the notion of distance and the right timing to perform perfect movements." The philosophy of the IJF Academy specifically applied to the host country of the Tbilisi Grand Prix, Daniel Lascau, IJF Sport Director and expert of the Academy, explained the key points of the new face of Georgian judo. "When we set up an Academy program, we ask students to be able to demonstrate their skills both on standing position and on the ground. "Everyone must be able to show, on the right and left, two techniques in each of the five groups in (tachi-waza) standing judo, as well as two techniques of immobilisation (osae-Komi-waza), choking (shime-waza) and key-arm lock (kansetsu-waza). This is a lot to know, but it is essential for the development of a quality judo. "It is very interesting to see how Georgian judo evolves. It must be said that Georgia was not well known for its ground work. But things are changing and we can say that it is thanks to the work we do to accompany the country's coaches. What they learn at the Academy, they retranscribe it little by little in their technical sessions with their athletes. The transfer takes place and we can only be happy about it. "Just this morning, we saw Georgian competitors working on the ground and even winning with ground techniques. They are no longer in a single logic of defence but they take their destiny into their own hands and try new things. It's a real evolution that can only enrich our judo." WAZA: Waza means technique, classified in throws (nage-waza), grappling techniques (katame-waza) and strikes (atemi-waza). Throwing and grappling techniques are also called “randori techniques”, used in practice and during the matches. 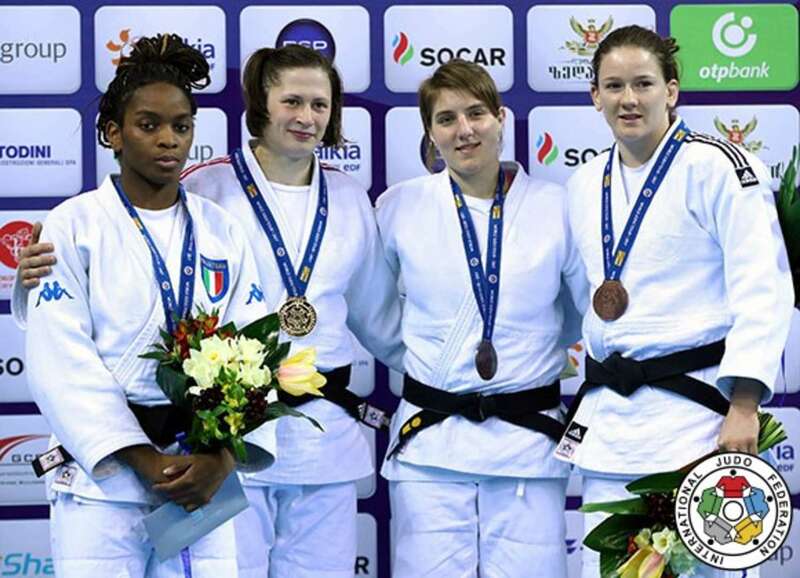 The final of the women’s -63kg saw Edwige GWEND (ITA) and the bronze medal of the last Zagreb Grand Prix in 2016, Magdalena KRSSAKOVA (AUT) fighting for gold. 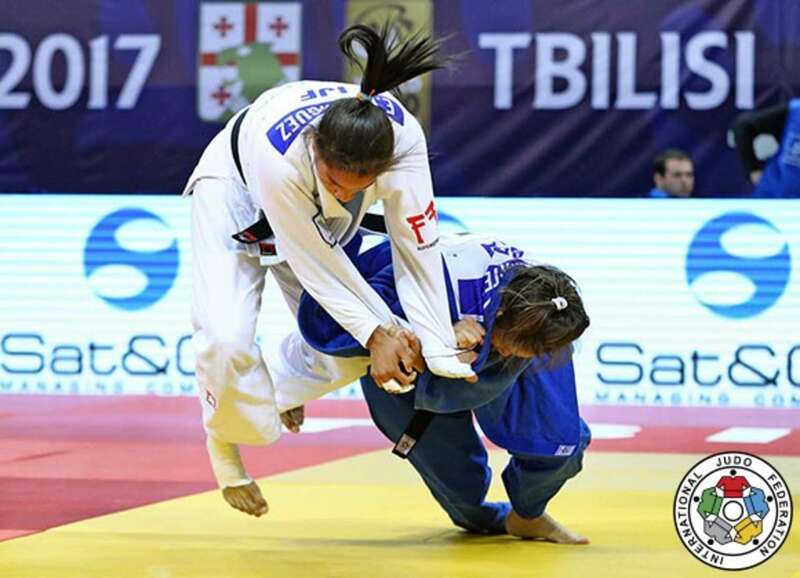 With that final, the Italian could already expect a better result than last year, as she finished third on the occasion of the 2016 edition of the Tbilisi Grand Prix. Both competitors entered the last minute of the final with one shido. But less active than her opponent, GWEND was penalised again in the last second. As the penalties do not count anymore at the end of the first four minutes, it was time for the golden score. It is generally the moment, that athletes chose to accelerate in order to try to catch their opponent by surprise and that’s what they actually did but with no score during the first minute of extra time, despite a very strong attack from the Austrian, that was initially counted as waza-ari but then cancelled. Motivated as never before KRSSAKOVA continued to push GWEND and took the opportunity of a weak action from the Italian to counter her for waza-ari and a surprising victory. The first bronze medal match to be displayed on the tatami of the New Sports Arena opposed Nekoda SMYTHE-DAVIS (GBR) and Andreja LESKI (SLO). 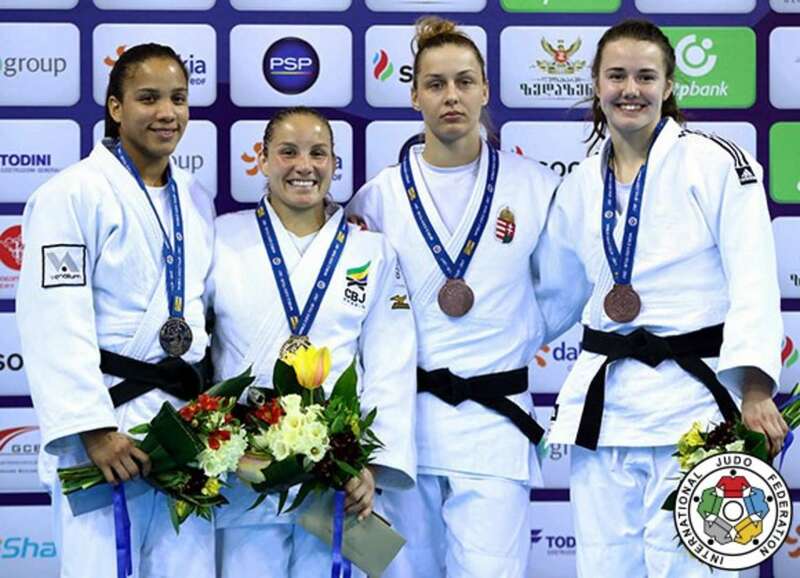 The Slovenian needed 30 seconds to win her third Grand Prix medal as she combined a powerful standing action immediately followed with a shime-waza technique for a clear ippon. In the second bronze medal fight Kamila BADUROVA (RUS) was opposed to the winner of the last Tokyo Grand Slam, Kathrin UNTERWURZACHER (AUT). Top seed of the category, the Austrian was hoping for a final again here in Tbilisi but contrary to her teammate, KRSSAKOVA, who surprisingly reached the final, she could not win against Edwige GWEND in the semifinal. Favorite of the bronze medal match, UNTERWURZACHER concluded with a superb piece of groundwork and an osae-komi-waza for ippon, winning her 11th Grand Prix medal! With any doubt Elvismar RODRIGUEZ (IJF) and Maria PORTELA (BRA) were the stronger athletes of the category and they proved it by entering into the final. 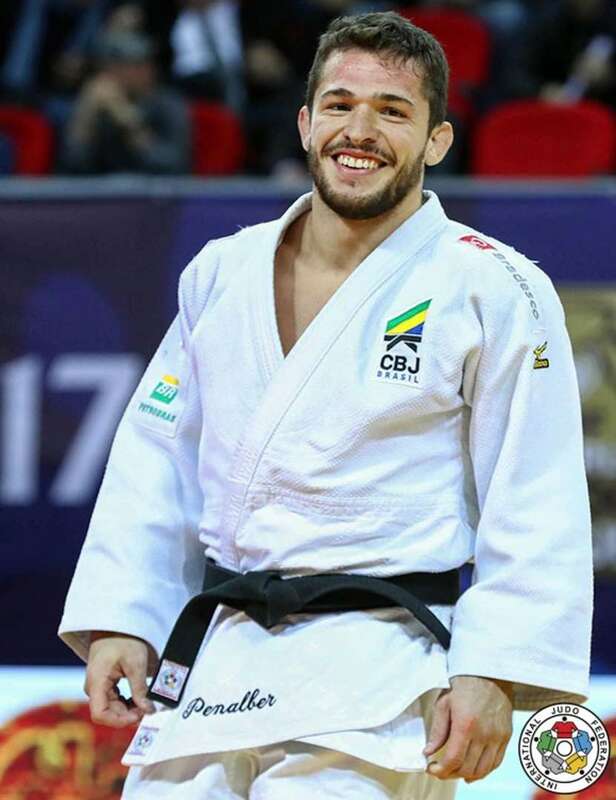 Supported by the IJF, RODRIGUEZ who currently trains in Hungary, was the first in action pushing PORTELA to be penalised for passivity. Changing direction regularly, from right to left, and using small hashi (leg) techniques to destabilise her opponent, RODRIGUEZ seemed to dominate PORTELA who remained dangerous on counterattacks. Second by second, the regular time was approaching to the end, pushing both athletes in golden score, where everything can happen. But just before that, RODRIGUEZ was also penalised with a shido, which could play an important role in the golden score to come. And that shido indeed played a central role. After more than three minutes and a half of golden score, the score was still one shido each, when RODRIGUEZ got penalised a second time for blocking her opponent. If the penalty didn’t play a central role during regular time, they were in golden score. PORTELA could enjoy a tight win, but a good win. GERCSAK Szabina (HUN) was the first to score against Valentina MALTSEVA (RUS) during the first bronze medal match of the category. 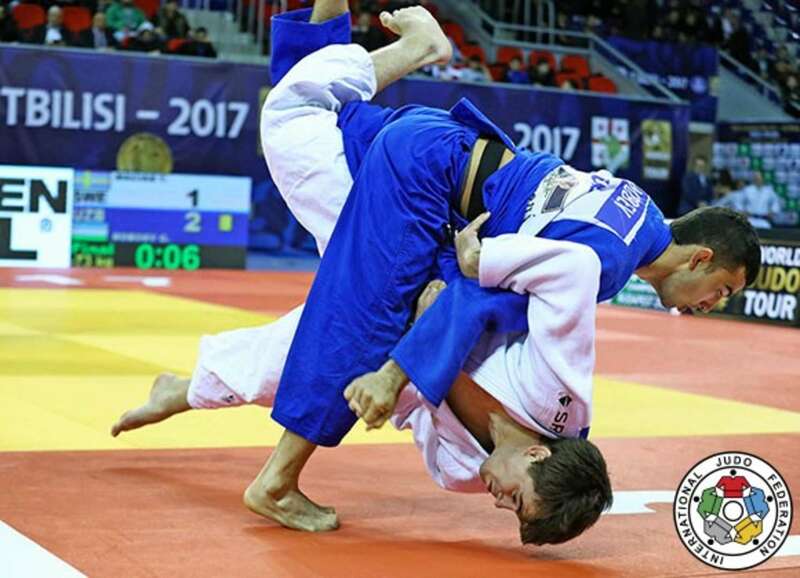 The 20-year-old Hungarian added one more waza-ari score with a maki-komi technique, followed by an immobilisation for an other waza-ari, ending the bout with that three waza-ari advantage. Natascha AUSMA (NED) and Anna BERNHOLM (SWE) faced off in the second bronze medal match to complete the podium. In a very close fight, AUSMA could finally take the advantage as BERNHOLM was penalised a third time for hansokumake. The Swedish should have been warned already as she was awarded with the second shido for a attempt to block her opponent. The final of the day opposed the two top seed athletes of the category, Tommy MACIAS (SWE) and Giyosjon BOBOEV (UZB). After a bit more than a minute, both athletes had already confirmed that they were the best of the day, as both had scored a waza-ari. The Uzbek added a second waza-ari with an immobilisation after MACIAS made a big mistake and literally offered the score to his opponent. The Swedish kept believing that he could score again, but despite his willingness had to concede the victory to BOBOEV, after what can be called an amazing fight. 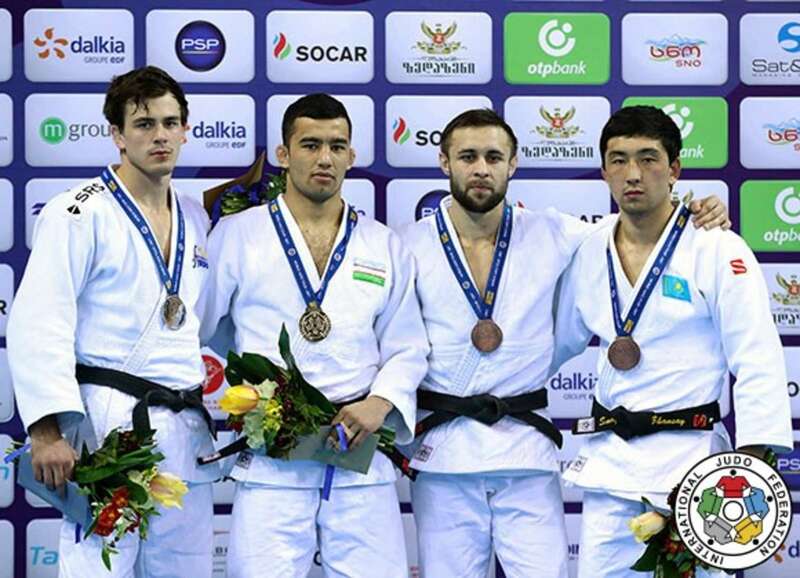 Having already two Grand Prix medals, with bronze in Tashkent 2015, and silver in Tashkent 2016, the Uzbek this time claimed on top of the podium. Those three medal can be added to the two Grand Slam medals that BOBOEV already owned. The first bronze medal opposed Uali KURZHEV (RUS) and the winner of the 2016 Pan-American Championships, Arthur MARGELIDON (CAN). With no medal on the international circuit, MARGELIDON, was hoping for a positive result this time, but this was not KURZHEV’s idea who threw the Canadian with a counterattack and a first waza-ari. After both athletes were penalised, the Russian accelerated a tiny bit the rhythm, enough to bring the Canadian down and immobilise him, but only for a few seconds as MARGELIDON, having a rib injury, tapped and offered the bronze medal to KURZHEV. In the second bronze medal fight, Zhansay SMAGULOV (KAZ) faced Tato GRIGALASHVILI (GEO). Suddenly the audience woke up, ready to cheer up for their local athlete. After one minute and a half, SMAGULOV launched a first strong drop-seoi-nage for a waza-ari. Today the support of the public was not enough to push GRIGALASHVILI. For sure, the 17 year-old Georgian, who is just coming out of the Cadet age division tried his best and can dream about a bright future, but today, SMAGULOV was too strong and sent him again on his back with a rough o-uchi-gari for ippon. The enthusiastic public mutually applauded for its athlete and for the beautiful judo produced by SMAGULOV. The last final of the day was announced to be explosive between the 2015 World bronze medallist, Victor PENALBER (BRA) and the four-time Grand Slam medallist Alan KHUBETSOV (RUS). With a superb sode-tsuri-komi-goshi awarded with a ippon the Russian believed that he had won. But the video was perfectly clear: to conclude his movement, KHUBETSOV grabbed PENALBER’s trousers below the belt. Without that help, the throw would not have been possible and therefore the ippon was converted into a shido. But as the Russian was already penalised two times, this third shido became a hansokumake and victory for PENALBER who could step off the mat with a big smile, knowing that he was closer to the silver medal a few seconds earlier. After one minute in the first bronze medal match Owen LIVESEY (GBR) and Saeid MOLLAEI (IRI) were still running after a first score. One minute later, only one shido was put on LIVESEY for stepping outside of the competition area and a few seconds later a second penalty was awarded to the British. After the four minutes of regular time, the decision would have to be made in the golden score. When Owen LIVESEY engaged a kata-guruma technique, MOLLAEI simply blocked him and concluded with an arm action awarded with a waza-ari. The second bronze medal match saw Aziz KALKAMANULY (KAZ) and Denis KALININ (RUS) stepping on the mat for a medal. Both athletes seemed to be able to neutralise themselves until KALKAMANULY dropped on his knees for a very low morote-seoi-nage. KALININ blocked the attack for one or two seconds, before the Kazakh literally jumped back up to turn KALININ for a beautiful ippon.